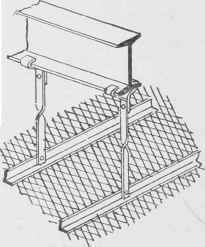 As the roofs of high buildings are in general made with very little pitch, the same construction may be used here as for the floors, but a special treatment will be required to retain a level ceiling in the upper story. This is usually done by hanging steel T-bars at a level below the roof, and upon these a ceiling may be laid either of terra-cotta blocks to be plastered, as in Fig. 224, or of metal lathing, Fig. 225. Exterior Walls. The construction of the exterior skeleton of a fireproof building will require special treatment according to the covering material to be used. While the adopted type of floors may be carried throughout one or several buildings, by a simple repetition of methods, the construction of the outside frame will vary with the different materials used in different buildings, or often in different portions of the same building. In general, the weight of the exterior walls, especially above the first two stories, must be carried by the steel frame. The two or three lower stories, on the street side being largely glass area, the piers are often carried by the foundations below. These piers are sometimes of stone enclosing the steel columns, but brick or terra-cotta are used to great extent. For the upper stories, especially of a fireproof building, brick or terra-cotta are to be recommended, not only on account of the fire-resisting qualities, but also because of the ease with which they may be built around the skeleton frame. Fig. 223. Steel Beam in Wall. Fig. 224. Hanging of Terra-Cotta Ceiling. Fig. 225. Hanging of Wire Lath Ceiling. In general, the exterior treatment of a building of skeleton construction will resolve itself into a series of piers, more or less marked in character, which enclose the vertical supports, the space between being to a great extent occupied by windows, with a horizontal piece of masonry separating the windows of each story and covering the floors. 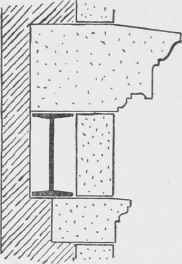 The masonry enclosing the columns is generally supported by brackets or angles riveted to the columns, and the horizontal bands of masonry between the windows, called spandrels, are supported by beams of requisite size and shape, which run between the columns and are riveted to them.